This just in... straight from Perth, Australia to you, via Copenhagen. The bike culture here in Perth/Western Australia is quite poor, but it is rapidly growing...well, we do have great weather nearly all year round, and a very flat city. Just too many car obsessed people, but we are spreading the word! Keep it up in the North! Thanks Flo and Sophie! 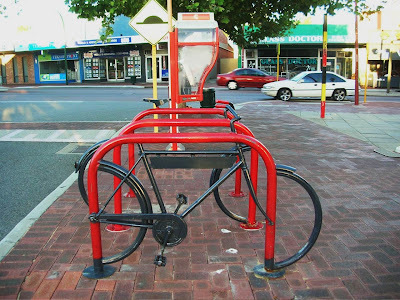 Bike racks are so cool when a little creative thought is put into them. By all accounts the low level of bike usage in Western Australia is a result of helmet laws that came into effect in 1991. This mirrors the same statistics in other cities and regions that implemented helmet laws. In Western Australia, after rising steadily at about 12% a year, bike usage took a nosedive after the legislation. A fall of 30%.